Finding a new lens to tell a classic tale is what can draw an audience in. In Fab Marquee's Macbeth of the Oppressed, adapted and directed by Tom Slot, Shakespeare's Scottish play gets an invigorating interpretation through a gender and ethnically fluid focus. In Macbeth of the Oppressed, Slot takes the infamous story of murder, greed, and power and introduces a new perspective on gender battles. The story, sliced and altered from the source, follows Macbeth as he seeks the throne from Queen Duncan after a trio of weird witches projects a prophecy. When greed and power are won, Macbeth rules alongside the level-headed Husband Macbeth as his reign leads to a complete upheaval of sanity. With Macduff and Banquo also experiencing the gender swap, a new narrative is formed. What Slot does well is begin a new vantage point to be created. But it seems as if it doesn't quite reach its full potential. Playing director as well, what Slot envisioned in his head did not always translate on stage. Even with the ability to key into the moments that propelled the thesis, Slot did not always strike. There seemed to be some confused moments that offered some contradictions and disconnect. With the focal story on the Macbeths, Slot chose quite an interesting intermission spot. 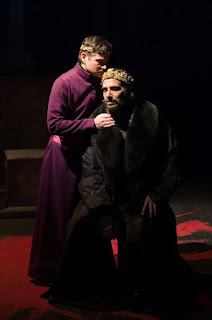 Despite being the sole blackout in the act, the audience did not react or clap following Banquo's death scene as it did not feel as it was a proper intermission point, especially in the arc of Macbeth. When it came to utilizing the space, the theater at the 14th St Y engulfed the company. Despite a giant cast, it was far too big for Slot's intimate storytelling. With staging being a bit all over the place and generally safe, the stakes were diminished at the end due to Slot having Team Macbeth and Team Macduff rotate on and off stage. When Slot did make some interesting choices they were much appreciated. The one that stands out is the infamous "out, out damn spot" where rather than refer to blood, it was Husband Macbeth's wedding band. While the dynamic of gender battles was fascinating to watch, the power struggle between Macbeth and Husband Macbeth was the most intriguing element of Slot's story. There's a natural element of debate in the text of who is truly and charge and David Stallings as Husband Macbeth seemed to be pulling the strings in this version. Stallings had a subtle dominance and control over Antonio Minino's Macbeth. And with the structure of the narrative, it left you wanting more. Minino as Macbeth took a presentational approach to the character. It was an interesting choice that allowed some humor to shine through. Elisabeth Preston as Banquo was quite good. Preston took the loyal companion to new heights, adding in a maternal element to the character. Mel House was determined as Macduff. Her venture in vengeance was something ferocious. Olev Aleksander may not have looked like the right person to normally play the feeble Malcolm but in this version he was rightly cast. The trio of witches played by Jams Edward Becton, Brianna Sakamoto, and Lavita Shaurice worked soundly as a unit, blending well when they broke out into an oddly placed musical rendition of the spell. What Macbeth of the Oppressed captured well was the dark and moody world of the play. The splatter pattern floor was a strong choice in the scenic design but the rest of the set offered very little. While the cubes melted into the darkness they were always present. Lighting designer Daniel Gallagher couldn't explore the nuances of space as Slot's staging was erratic, yet the moments into scenes that highlighted the throne was a clever touch. Jacob Subotnick created a bit of a soundscape via underscoring for parts of the play. To say that Slot needed to incorporate more of Subotnick’s mood-inducing score is an understatement. When it was present, it added such great depth. While Slot tried to gracefully slam into scenes, the lack of sound in between felt off. Macbeth of the Oppressed left much to be desired. The concept was there but the substance came up just short. The fluidity was strong but prior knowledge of the story aided that greatly.